Do you believe in magic? Magician and illusionist Criss Angel wowed audience members with his show “Criss Angel BeLIEve” on Oct. 19, at the Luxor Hotel in Las Vegas. Launched in 2008, the show is one of six Cirque Du Soleil shows housed in Vegas. I’ve been a fan of Angel since his television show “Mindfreak,” so going to see him was a must. As my family and I entered the theater, eerie music played in the background while blue lights illuminated the stage where a single, giant head of a rabbit with one ear sat. Before the show started, a crew member came and placed the other ear on the head. Upon the start of the show, a spotlight was placed on the rabbit head which in response, rolled over and exited the stage upside down on its ears. Following the opening act, Angel appeared in a cloud of smoke, levitating down to the stage toward a screaming wall of excited audience members. After introducing himself, Angel entertained the audience with one of his first illusions of the night. After randomly throwing wristbands into the audience, Angel asked each person who caught one a question. After three people had been questioned, Angel reminded the audience of a locked box that had been placed overhead before the show started. The box, still in plain sight, was lowered and inside of it, a piece of paper containing all the answers which the three people had answered was pulled out and read aloud. The crowd burst into applause. For his next illusion, Angel produced a single dove from his hands which flew to a tree on stage. He then continued to conjure more doves, sometimes making two doves out of one. When all had flown to the tree, an entire flock of birds flew out from the back of the stage and over the audience. The trick that amazed me most was when he brought a young woman on stage, showed her and the audience a large, empty, rectangular box which was then locked. Angel then asked the woman to pick her favorite motorcycle from a provided image but not to say her choice aloud. When he asked her to reveal her selection, the box was opened and there stood the physical version of the bike she had picked. Other tricks included cutting his assistant in half, and Angel disappearing and reappearing somewhere else seconds later. Despite the show being part of Cirque Soleil, I didn’t see much in the way of acrobatics. Despite Angel showcasing mostly basic tricks I had seen or heard of before, it was still entertaining. Being on the first row, I hoped maybe I could catch a glimpse of his secrets; however, I remained stumped after every trick. Angel was very personable, making us laugh as many times as he amazed us. At the end of the show, he allowed a few audience members, including myself, to go on stage and get a picture with him. 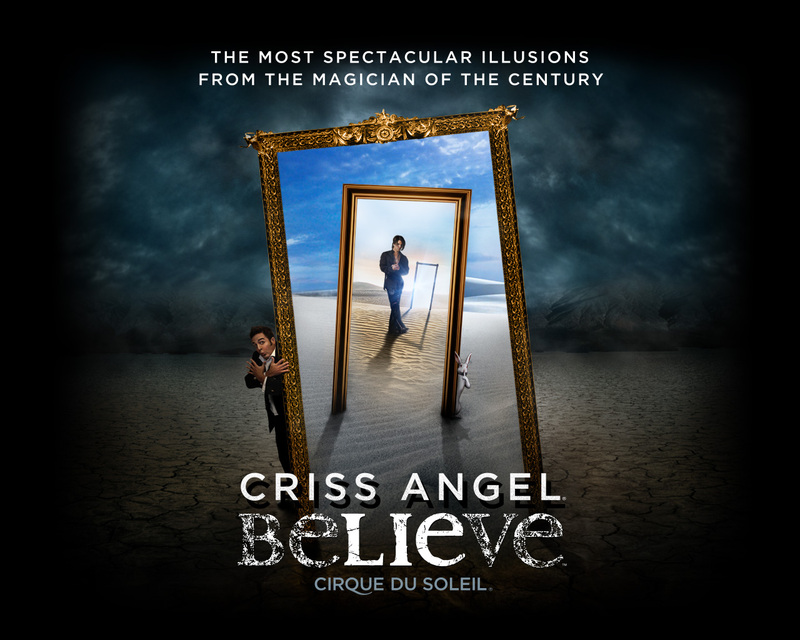 “BeLIEve” is a must-see production for anyone who is a fan of Angel or his television show. His good looks are just a bonus. I will definitely go see again on my next trip to Vegas.